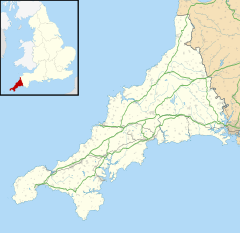 Truro (pronounced /ˈtrʊəroʊ/ (deprecatit template); Cornish: Truru) is a ceety an ceevil pairish in Cornwall, Ingland, Unitit Kinrick, an is the centre for administration, leisure an retail in Cornwall, wi a population o 17,431. Truro urban statistical aurie, which includes parts o surroondin parishes, haes a population o 20,920. It is the anerlie ceety in the coonty, an the maist sootherly ceety in Great Breetain. Fowk frae Truro ar kent as Truronians. 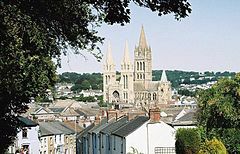 Truro initially grew as an important centre o trade frae its port, an then as a stannary toun for the mining industry. The ceety is well-kent for its cathedral (completed in 1910), cobbled streets, open spaces an Georgien architectur, an places o interest include the Royal Cornwall Museum, the Hall for Cornwall, Cornwall's Courts o Justice an Cornwall Cooncil. Wikimedia Commons haes media relatit tae Truro.